13.9 million viewers tuned in to watch all or part of the 28-hour “TeletónUSA,” which was broadcast on the Univision Network, Univision America AM radio network, and live streamed on Univision.com over the past weekend. 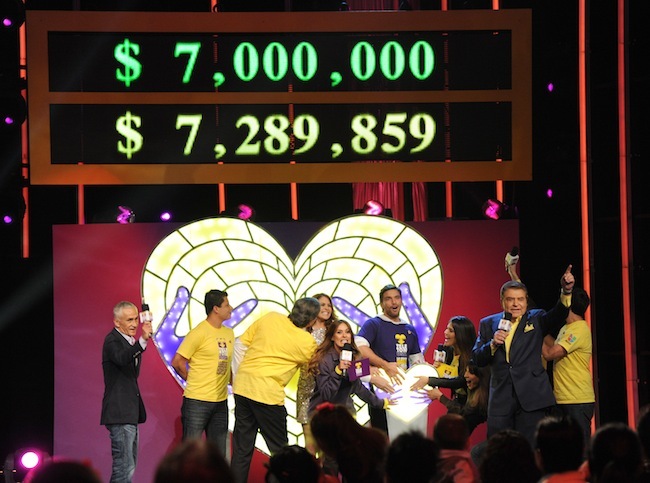 Univision Network and Fundación Teletón today announced that the first “TeletónUSA” raised $8,150,625 million for the benefit of children with disabilities, cancer and autism in the United States. 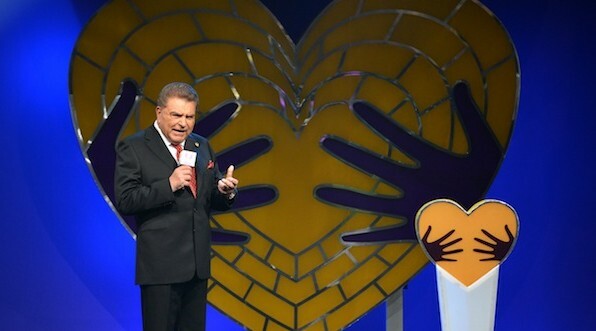 The TV fundraiser was hosted by Sábado Gigante’s” Mario Kreutzberger, aka Don Francisco and founder of Teletón in Chile in 1978, mirroring Jerry Lewis’ legendary MDA telethons. 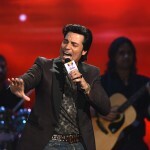 More than 100 Hispanic superstars and television personalities participated in the event, including: Lucero, Ricky Martin, Chayanne, Larry Hernandez, Pepe Aguilar, Pandora, Daniela Romo, Fonseca, Gloria Estefan, Graciela Beltrán, Jesse & Joy, Paulina Rubio, Pedro Fernández, Prince Royce, Ricardo Montaner, Los Temerarios, William Levy, Angélica María, Blanca Soto, Danna García, Juan Soler, Guy Ecker, Maite Perroni, Aarón Díaz and Fernando Colunga, among others. Emilio & Gloria Estefan, Don Francisco and Lucero. During the first hour of “TeletónUSA” (at 10-11 p.m. ET on Friday, December 14), the telecast delivered on average 2.6 million Total Viewers 2+, 1.3 million Adults 18-49 and 662,000 Adults 18-34, making Univision the No. 3 broadcast network in the time slot among Adults 18-34. On Univision local stations, “TeletónUSA” made Univision the No. 1 broadcast station in the time period in Los Angeles and Houston among Total Viewers 2+, Adults 18-49 and Adults 18-34; and in San Francisco among Adults 18-34. On Saturday, December 15, during broadcast primetime (at 8-11 p.m. ET), “TeletónUSA” made Univision the No. 3 broadcast network among Adults 18-34 (ahead of FOX and NBC). Additionally, on Univision local stations, it made Univision the No. 1 broadcast station in the time period in Los Angeles among Adults 18-34; in New York among Adults 18-49; in Miami and Houston among Total Viewers 2+, Adults 18-49 and Adults 18-34; and in Sacramento among Adults 18-49 and Adults 18-34. During the final hour of “TeletónUSA” (at 1-2 a.m. ET on Sunday, December 16), on average 1.6 million Total Viewers 2+, 863,000 Adults 18-49 and 418,000 Adults 18-34 tuned-in. Overall, the 28-hour broadcast on the Univision Network averaged 1.2 million Total Viewers 2+, 585,000 Adults 18-49 and 284,000 Adults 18-34. Funds raised during “TeletónUSA” will be shared with several organizations, including Miami Children’s Hospital, St. Jude Children’s Research Hospital, Children’s Hospital Los Angeles, Ann & Robert H. Lurie Children’s Hospital, SNACK (Special Needs Activity Center for Kids) & Friends, and Boston Children’s Hospital, as well as to build a children’s rehabilitation center in the United States. *Nielsen data was provided by Univision.